A big smile is now covering Khalil’s* face. This is not how he looked a few months ago. The 20-year-old Syrian man suffered severe depression and anxiety after witnessing war at home and seeing his life falling apart. Together with his mother and two older brothers, Khalil fled to Iraq from violence-wracked Hassakeh in northern Syria in August 2013. They now live in Domiz 1 refugee camp in the Iraq Kurdistan Region, which shelters around 45000 Syrian refugees. “When I arrived here, I could not stand that gruesome new reality of ours. I didn’t want to talk to anyone. I was on the verge of committing suicide because I could not bear living inside a tent. The conditions are very bad here,” says Khalil inside his dimly-lit tent. Thirty five-year-old Lina is another Syrian refugee living in Domiz 1. She took psychosocial training with International Medical Corps in February 2013, and became an outreach psychosocial worker providing mental health support to people from her community, including Khalil. She points out that Khalil could not accept his new refugee status. “At the outset, he even refused psychological therapy. But my encouragement and daily visit to his family inside their tent have finally led him to accept individual counseling,” said Lina. “The counseling sessions helped me a lot surmount my negative feelings and avoid intrusive bad memories and fears. Today I am aware that I cannot change history. I have to accept and move forward,” concluded Khalil. 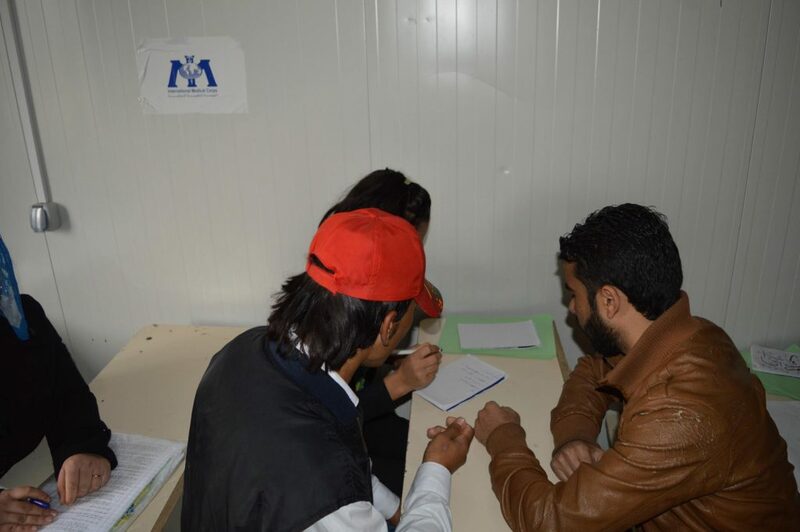 The young man is attending computer classes and applying for jobs in restaurants in the city of Dohuk, just outside the camp. Noura, 26, never thought she would switch her career from a makeup artist in Damascus to an outreach psychosocial worker for International Medical Corps in the Iraq Kurdistan Region. The young woman fled Damascus and settled in Domiz 1 refugee camp in the summer of 2012. “I had the opportunity to be trained and become an outreach psychosocial worker. I wanted to help my people. There are many social and family problems, such as gender violence, couples breaking apart and young people traumatized after experiencing atrocities in Syria, including kidnapping. These people need support due to their war experiences,” Noura said. Since October 2013, Noura has attended training sessions in psychosocial work led by International Medical Corps. She believes that she is very well placed to help her own people because she understands what they went through, as she is herself a victim of the violence in Syria. Noura said of her work, “I feel strong when I succeed in helping a person overcome their fears. In our culture, it is not easy to seek psychological support because of false social beliefs. Encouraging an individual to do so is a first step forward to success.” Noura sees more and more people who take the initiative and ask her for help. “Young people are so desperate that they now have the courage to overcome the stigma of mental health,” she adds. So far, she has seen 20 patients. Rojan is another Syrian refugee recruited by International Medical Corps to support service provision in Domiz 1 camp. In 2012, she was in her second year of university, studying English Literature. She wanted to become an English teacher, but the war in Syria interrupted her goals. She escaped with her family from the majority-Kurdish town of Qamishli in northern Syria. Strolling through the camp’s grid of mud alleyways, Rojan was going to attend a meeting with 11 International Medical Corps’ female psychosocial workers. “We are holding our weekly meeting today to discuss our patients’ cases with the [International Medical Corps’] psychologist,” she said. At the meeting, Rojan will raise the case of a 20-year-old woman who was forced into marriage in which she suffered abuse and constant battery. “There is a high rate of gender-based violence inside the camp. My role is to identify the cases and provide emotional support. When women feel comfortable with me, they share their experience of abuse. If the case requires specialised care, I refer them to International Medical Corps’ psychologist,” said Rojan. “Training sessions and the recruitment of people from the local community also helps in empowering Syrian refugees and in lowering unemployment rates,” adds Julie Davidson, International Medical Corps Team Leader for Refugee and Internally Displaced Persons Programs in Iraqi Kurdistan. Since October 2013, International Medical Corps has provided programs to build local capacity, including those that address mental health and gender-based violence, in both Domiz 1 and Domiz 2 refugee camps in Dohuk. This includes recruiting and providing training in psychosocial work to 14 Syrian refugees, giving them the tools necessary to support survivors of gender-based violence as well as those requiring mental health services. In addition, these psychosocial workers are also responsible for community outreach to spread the word about the mental health services provided by International Medical Corps. Over 200 Syrian refugees are benefiting from the capacity building program. “The capacity building program is very important because 1) psychosocial workers – who are themselves displaced – are being empowered and given the essential skills to work for gender equality and 2) they help gender-violence survivors to overcome the trauma of abuse in their community,” says Maria Ariza. International Medical Corps has integrated mental health and gender-based violence services into its refugee and internally displaced persons camp clinics to ensure that camp residents have access to much-needed support services. Vulnerable populations are identified through International Medical Corps’ outreach activities, referrals from trained clinic staff, and referrals from other organizations. Consultations are provided by psychologists and psychiatrists and other referrals are provided as necessary. International Medical Corps psychologists and psychiatrists have provided over 500 consultations to date, including follow-up appointments for the most severe cases.